Twenty years ago, Cessna gave birth to a military jet trainer that had wealthy private pilots with fighter jock dreams licking their chops. Here’s the story of how Cessna ended up with their promising design and why they walked away from it. In the late 1980s the Pentagon went looking for a trainer to replace both the Navy’s T-34 Turbo Mentor, and to some extent the T-2 Buckeye, and the Air Force’s massive fleet of T-37 Tweet primary jet trainers. This program became officially known as the Joint Primary Aircraft Training System, or JPATS. The idea behind the program was to purchase an aircraft “off the shelf” instead of designing one from scratch. The problem was that there was no U.S. built aircraft in production to fit the JPATS program requirements. As such, entrants went looking for foreign partners that could either assume some risk in the development of a new aircraft or had something in production that could be adapted to the program’s needs. These consortiums and their aircraft included the Lockheed/Aermacchi MB.339A T-Bird II, Beech/Pilatus PC-9 Mk. II and Grumman/Agusta S.211A, among others. Cessna, who provided the USAF’s primary training platform for decades with the T-37 Tweet, took an entirely different route and got creative with their private jet parts bin. Since the 1970s, the Cessna Citation line of private jets has been the hallmark or reliability, usability and affordability. The Citation One, and a whole family of jets that have sprung from its lineage, used straight wings for turboprop like performance around the airfield and turbofan engines for fuel economy. Today Cessna’s range of Citation Jets had widened drastically, to include mid-sized models and even the fastest bizjet in the world, the Citation X. After the JPATS requirements were known, Cessna took its latest light business jet design — the T-tailed CitationJet, also known as the CJ1 — and applied its anatomy to a tandem seat jet trainer design. The outcome was the Cessna 526, a fairly sleek and tactical-looking jet aircraft that had an amazing 75 percent commonality with the CJ1 light business jet that it evolved from. This included the CJ1’s highly fuel efficient and reliable Williams FJ44 turbofan engines, landing gear, wings, hydraulics, electrical and fuel systems. Even much of the then cutting-edge electronic flight instrumentation system (EFIS) was ported over from the CJ1. Keep in mind the CJ1’s design evolved from two decades of Citation business jet success. What was new was the 526’s fuselage, tail and the inclusion of ejection seats, as well as the fact that the 526 was fully aerobatic and could withstand seven times the force of gravity during aggressive maneuvers. The entire Cessna 526 program utilized a small “Skunk Works”-like team of mostly retired veteran Cessna engineers and machinists. The team had to be light, agile and experienced due to cost and time constraints, and they were just that. The prototype 526 flew on December 20th, 1993 and the production example flew just a few months later. The jet receiving FAA Part 23 certification in just six months, which was supposedly a record at the time (and may still be today). The test regime included an astonishing 850 spins in just 500 total flight hours. The 526’s handling qualities were said to be exemplary and totally straightforward. Pilots fell in love with the jet and praised its nimbleness and stability. Additionally, cost per flight hour modelling was ported over from the CJ1 as they were by and large the same aircraft. When it came to the competition, the half dozen other companies vying for the JPATS contract all used a foreign partners on the project, leaving Cessna’s entrant as the only truly all-American candidate. Many assumed Cessna would take the JPATS contract because of the 526’s American-made pedigree, the jet’s quick certification, Citation lineage and commonality, as well as the fact that Cessna’s Tweet had performed well since the 1950s in the primary trainer role. In addition to its association with the JPATs bid, Cessna had a fully FAA certified aircraft that was ready to be put into production with great commonality with their hot selling CJ1 business jet. At the time of the 526 development, it was just becoming popular to import ex-Soviet jet trainers and fighters as private aircraft. This, along with the fact that many models of Citation Jets were already well known for their single pilot capability and the brand had a strong “cult” following, made it seem entirely possible that Cessna could market the 526 to civilians and make a profit in doing so. For some operators the 526 would actually be a supplement to other Citations they own, or for potential buyers an adventurous alternative to it. In fact, some Citation users were ready to put deposits down on the jet if it were to be offered to the public. If produced for the civilian market, the aircraft would have been akin to something between the ultimate toy and a useful business tool as it still had the ability to scoot its passengers around the U.S. to anywhere a Citation could. When not in use as a personal transportation device, the 526 owner could make use of its high maneuverability, learning jet aerobatics and formation flying. The 526 could also utilize the sprawling Cessna Citation training and Service Center infrastructure that exists all around the globe and that is fully FAA certified. As a result, unlike similar warbirds, it would not have to be registered under the Experimental Category. Other roles, like civilian jet aircraft flight training and upset attitude and spin recovery experience training could have also made the 526 viable in the non-military marketplace. The 1990s also saw the Pentagon expand the commercial adversary support marketplace, one that is now exploding in size. Today, on the low-end and middle-end of the spectrum, aircraft like the L-39 Albatross, Hawker Hunter, A-4 Skyhawk and Lear 35 perform duties like target towing, missile threat replication, JTAC training and electronic attack simulation. Versions of the 526 could have proven a more affordable, supportable and reliable option for these training and support missions. On June 22nd 1995, the Beechcraft/Pilatus consortium and their version of the Pilatus PC-9 turboprop trainer (renamed the T-6 Texan II) was announced as the JPATS competition winner. This was a startling move to many seeing that the USAF had long used a jet for its primary trainer. As such, the Air Force would have to adapt its training program to introduce students to a turboprop before a jet in the training pipeline. The Navy on the other hand would be getting another turboprop to replace its T-34C Turbo Mentor fleet. The fuel efficiency and lower sustainement costs of a single engine turboprop aircraft compared to a twin engine jet were key factors that hurt Cessna in the the long run. Cessna protested the contract award to the Beech/Pilatus consortium, which was denied. After that the company quickly abandoned the 526 program entirely regardless of its potential civilian uses or chances of providing a similar JPATS role to foreign nations, many of which flew the T-37 like the USAF. It was a sad end to what in retrospect seems like a somewhat promising aircraft design. Strangely enough, the 526 was not the first time Cessna eyed offering a variant of a military jet trainer to civilians. Back in the late 1950s, a concept based around the T-37 Tweet called the Cessna 407 went as far as mockup stage before also being abandoned by Cessna. It was a four place version of the Tweet with a series of creature comforts and upgrades for ease of operation. The concept was put forward as being able to fulfill private and military VIP and liaison roles. Cessna dropped the idea as they saw the poor level of potential customer interest of the similar Morane Saulnier MS 760 that Beech had made an attempt to import en masse from France. In many ways both aircraft were ahead of their time as they were precursors to the Very Light Jet category that is blooming today. 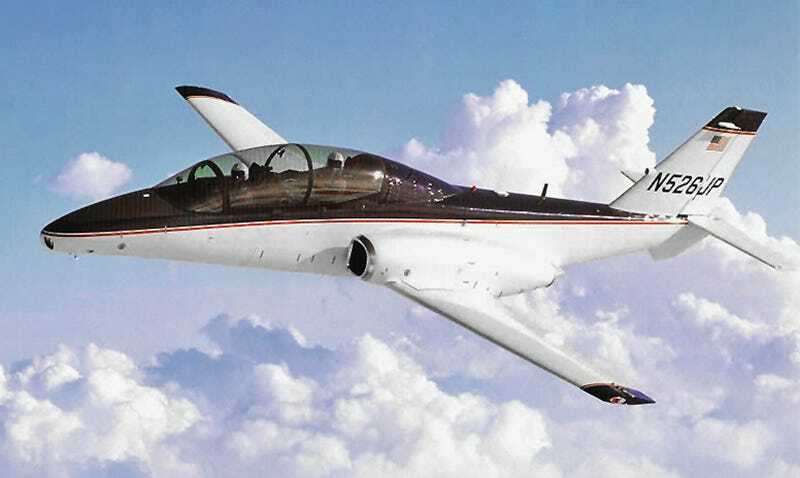 The legacy of the 526 lives on today in the Textron Scorpion, a design that shares less outright visual commonality with any existing aircraft, but like the 526, it utilizes Cessna’s expertise and technologically mature components of the Citation Jet line. The Scorpion is also a self-funded endeavor and is made from the outset to be adapted to many users needs. If you want a light attack aircraft for use in permissible airspace, the Scorpion can be adapted to that role. If you need a jet trainer? Same. A border and littoral surveillance aircraft? You bet. When it comes to price, Textron says the Scorpion will cost less than $20 million acquire and under $3,000 per hour to operate. Textron has been pushing the Scorpion hard, flying around the globe to major air shows and military demos, and their hard work may be paying off with a few air arms eyeing it for various uses, the Indian Air Force is even interested in it as an intermediate jet trainer. Such a contract could be quite large, with hundreds of aircraft being built, and with it Cessna would be back in the military trainer business in a big way.